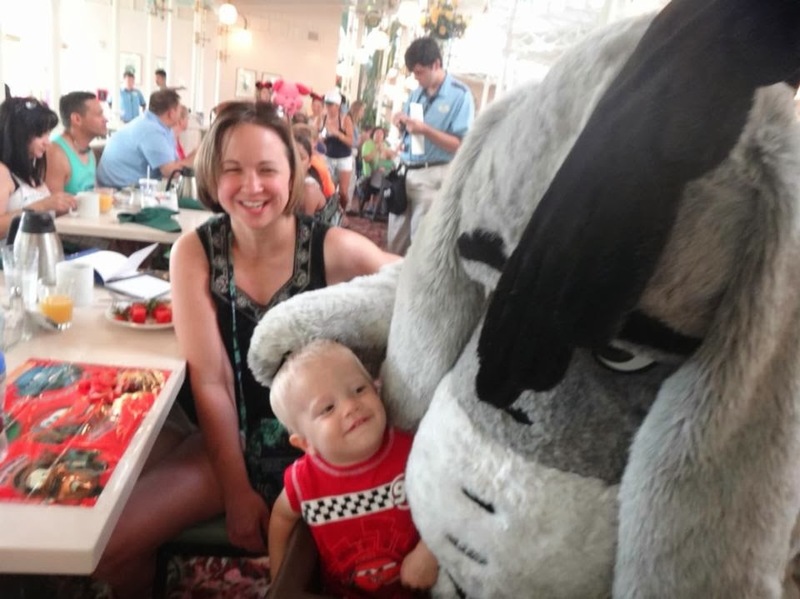 Running on Pixie Dust: What I Learned in WDW with a Toddler. . .
What I Learned in WDW with a Toddler. . .
One of Brody's favorite things to do is look through our photo book from our Disney trip. He loves to point out the characters and all of us. He talks to the characters like they are sitting right next to him as he claps and laughs. When we had said that we were going to extend our Disney Cruise with 3 days in WDW, we had a lot of nice smiles and sideways looks as if people were telling us "good luck!" 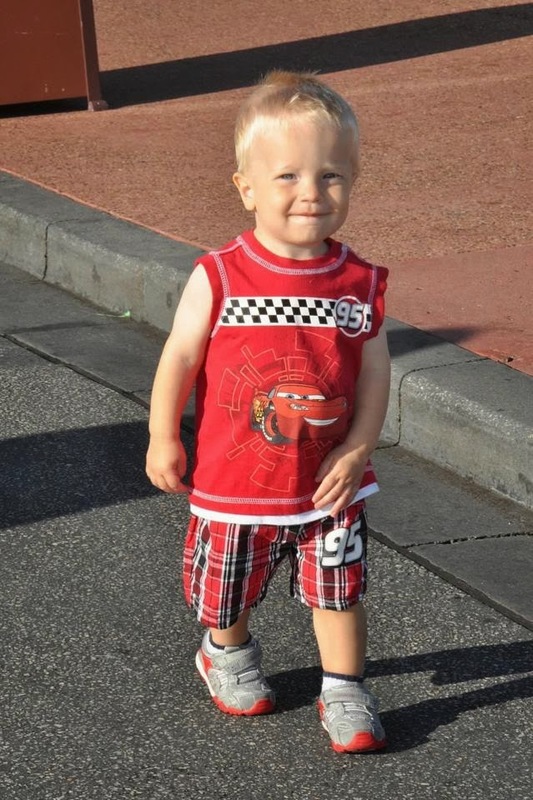 Disney with a toddler does have some challenges, but it can be a rewarding trip if you remember a few tips and tricks along the way. Here are some things we learned with our 17 month old that may help you if a trip with a little one is in your future! Brody cruising Main Street USA! Stay on the Monorail if you can afford it - We were lucky to only be staying for 3 days and in a relatively cheap season at Disney so we could afford the Contemporary this trip. It was wonderful having the monorail so that you didn't have to break down a stroller for the bus ride and also endure the multiple resort stops on the Disney transportation. You will have to use the busses for some parks, but with the young crowd you're probably going to spend most of your time in Magic Kingdom. It also is quick to get back for naps when needed. We LOVED this and would continue to try and stay at a monorail resort as long as we have kids that are stroller aged. Take Breaks - Just face it now that you are not going to get to do everything in Disney. That was a hard reality for me to adjust to, but napping / breaks are crucial for the preschool set. 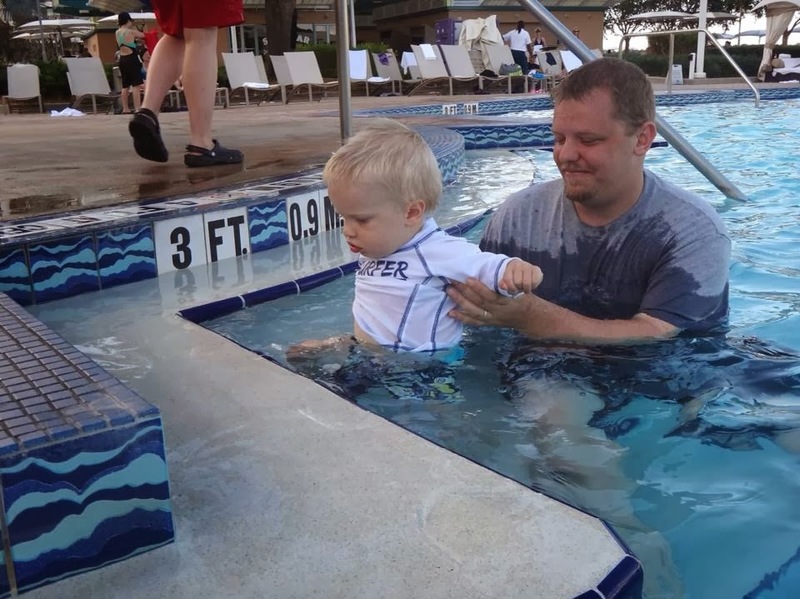 We went back to the resort for pool time and nap time in the middle of the day which helped a lot. Also, since we were traveling in July we avoided the parks at the hottest part of the day. Character Meals are Awesome - Little ones love the characters (well, most do. . .some run away screaming!) Little ones are also not very patient which can make you forget you're in the "happiest place on Earth" as you're standing in long character meet and greet lines. The Character meals give your kids a chance to meet the characters while taking their breakfast / lunch / dinner break. I'm personally a fan of the breakfasts. They are cheaper then the lunches and dinners and I also find the food to be the most toddler friendly for my picky eater. Great tip. . .schedule your character breakfasts before parks open to the public if dining in a park restaurant. You get early admission to the parks and some great photo ops at popular spots with no crowds! How about having breakfast with some friends from the Hundred Acre Wood? Prepare to wait - No matter when you go to Disney, peak season or off peak season, you will undoubtedly find yourself in lines. . .lots of them. Think about things that are small and easy to carry in your backpack / diaper bag that will entertain your kids if they get antsy. Maybe download some of their favorite shows to your smartphone or someone else suggested bringing pipe cleaners that you can bend into lots of different shapes and play with while you wait. Take Advantage of the Baby Centers - Even if your little one isn't an "infant" anymore, the infant care centers are a great place to catch a break from the heat and hustle and bustle of the parks. They have a nursing area if you have a really little one, diaper changing areas, rocking chairs and toys and a TV with some cartoons. I didn't know these existed because they are so well hidden in the parks. If traveling with a little on is in your future, best of luck!